San Diego, CA – January 16, 2019 – BridgeWave Communications, a leader in next-generation wireless backhaul systems, today announced that it has provided its Flex4G-10000, which delivers true fiber capacity and performance, to The Statue of Liberty-Ellis Island Foundation, Inc. to extend high speed connectivity from Ellis Island to Liberty Island and the new Statue of Liberty Museum, which is scheduled to open in 2019. The Flex4G-10000 provides the Foundation with the backhaul performance required to support Wi-Fi connectivity for more than 4.3 million people who visit Liberty Island annually. 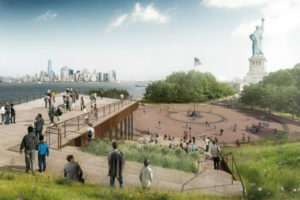 It will also provide connectivity to the new Statue of Liberty Museum – which is the first construction in many decades on the island – and which will host up to 25,000 visitors per day. When the new museum opens, it will allow millions more visitors to enjoy the Statue of Liberty experience and be inspired by her history and message of freedom and opportunity. The BridgeWave Flex4G-10000 is a market leader in 80GHz systems with hundreds of links deployed worldwide. It offers fiber capacity and performance, dramatically lowers capital costs, provides 256-bit AES encryption for highest data security, and provides the highest system gain in the industry to ensure maximum throughput at the longest distances. The system delivers 9.7Gbps full-duplex data throughput in a single, zero-footprint all-outdoor solution and can quickly and easily scale from 9.7Gbps to 19.4Gbps (2+0 configuration) to meet future bandwidth requirements. The Statue of Liberty-Ellis Island Foundation, Inc. is a non-profit organization established in 1982 to raise funds for and oversee the historic restoration and preservation of the Statue of Liberty and Ellis Island. For more than 35 years, the Foundation has collaborated with the National Park Service/U.S. Department of the Interior in what has become the most successful public-private partnership in U.S. history, having raised nearly $1 billion. In addition to restoring the monuments, the Foundation created museums on both islands, The American Immigrant Wall of Honor®, the American Family Immigration History Center® and The Peopling of America Center®, which in 2015 transformed the museum on Ellis Island into the Ellis Island National Museum of Immigration. The Foundation is now overseeing the fundraising and construction of the new Statue of Liberty Museum scheduled to open in 2019. The organization’s endowment has funded over 200 projects that support of these national treasures.